Gravel root was given the name Joe Pye, for the New England Native American healer who used it to induce sweating and treat typhus. Queen of the Meadow has been utilized to flush the bladder and kidneys with increased urine flow and help to remove gravel, stones and accumulated toxins from these organs. It is believed that this herb has been beneficial in relieving gout, rheumatism, a swollen neck related to thyroid problems and the stiff joints, often associated with accrued uric acid in the kidneys. Meadowsweet is believed to relieve back pain that is frequently caused by kidney inflammation. It has also been used to relieve inflammatory infections of the urinary tract and urinary-genital area because it is a soothing cleansing herb. It is thought to be useful for related conditions including cystitis, prostatitis, urethritis, vaginitis, and leukorrhea. Joe-pye weed has also been used for arthritis, edema, gout, rheumatism, migraines, liver problems, prostate problems, swollen neck related to thyroid problems, painful menstruation, ringworm and vaginal problems. The herb is believed to help promote urine production, and the increased flow may help to flush waste from the kidneys, removing stones and sediment and also helping to dissolve systemic, inorganic crystalline deposits. This action is also believed to be the reason it has been used to help relieve rheumatism, arthritis, gout and joint stiffness by expelling the uric acid deposits and other toxins that have amassed. It is also useful for weak hair and nails, to keep solids and liquids in balance in the body (kidney functioning). For stones, Gravel root combines well with Corn Silk, Hydrangea, and Stone Root, aka Collinsonia Root. It is also believed to be beneficial for urinary tract infections, as it helps to flush out harmful bacteria from the urethra, the bladder, or the prostate gland. A powerful diuretic, it eliminates toxins and supports the function of the kidneys. This action also helps to relieve prostate enlargement. When there is impotence, Queen of the Meadow has been used by herbalists to help tone the system. Queen of the Meadow is also used to relieve the back pain that is frequently caused by kidney inflammation. And it has been used for the treatment of enuresis (involuntary discharge of urine usually during sleep at night), which is helpful for children and incontinence in the elderly. 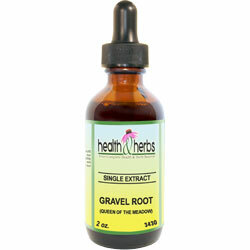 Gravel Root tincture has been used to encourage a reliable urine flow in cases where the urge is there, but the flow is not. Also helps to remove excess retained water from the body, which benefits dropsy/edema and excess water weight. Queen of the Meadow is often suggested by herbalists to be used to relieve severe menstrual cramping and pain. There are some claims that it may be beneficial in cases of threatened miscarriage. Queen of the Meadow is believed to help women who experience difficult menstrual periods, by promoting and regulating its flow. This action helps to relieve two specific conditions, amenorrhea (the absence or suppression of menstruation) and dysmenorrhea (painful and difficult menstruation). A diaphoretic that stimulates perspiration and sweating, it not only cools the body and lowers intermittent fevers, but also helps to expel toxic wastes through the skin. Herbalists have suggested that you should notice a reduction in body temperature almost immediately after consumption of Queen of the Meadow. But continue to monitor temperature, as a prolonged elevation of body temperature is a serious health concern. Queen of the Meadow is said to influence the entire nervous system, and its relaxant qualities are thought to be useful in relieving nervous conditions, migraines, headache, hysteria, hypochondria, and flatulence. Ingredients: Queen of the Meadow, aka Gravel Root, Structured Water, 20% Alcohol. Non-Alcohol: Queen of the Meadow, Structured Water, Vegetable Glycerin. Contraindications: Queen of the Meadow should not be used in conjunction with prescription medications without consulting a physician. Queen of the Meadow should not be taken by persons with current or past liver disease. Medications that increase the breakdown of other compounds by the liver interact with Queen of the Meadow (i.e., carbamazepine [Tegretol], phenobarbital, phenytoin [Dilantin], rifampin, rifabutin [Mycobutin], etc.). Gravel Root interacts with lithium; as a diuretic, it affects how much remains in the body. Talk with your healthcare provider before using this product if you are taking lithium or any other prescription medications.